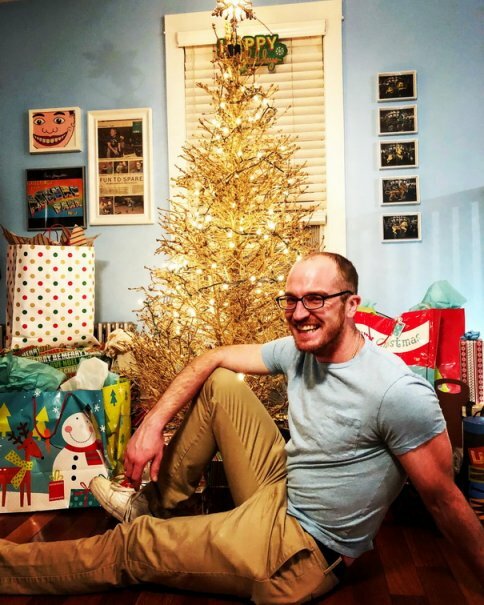 My boyfriend and I bought our Christmas tree two days after Thanksgiving in the parking lot of a grocery store. Not uncommon. The deal was attractive — just $31.99, and we could pick any tree. With a bottom trim and wrap, the total came to about $40, which was still a bargain, considering that we usually spend between $45 and $60 for a tree each year. It was a beautiful tree. Emphasis on the was. 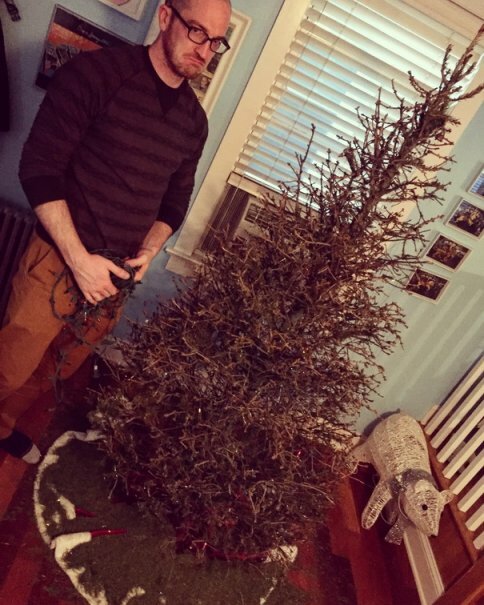 Less than three weeks after we erected and decorated it in our home, it was dead. And I mean, deeeeead. I heard needles dropping off sporadically, and then whole ornaments were dropping to the floor. I watered it. Plenty of water. But Mother Nature's nectar wasn't able to salvage this pine. To remove the risk of fire, we took down the rest of ornaments and unstrung the lights, and in the process every. single. needle. fell off the tree. I've never seen anything like it. The proof is in this picture. 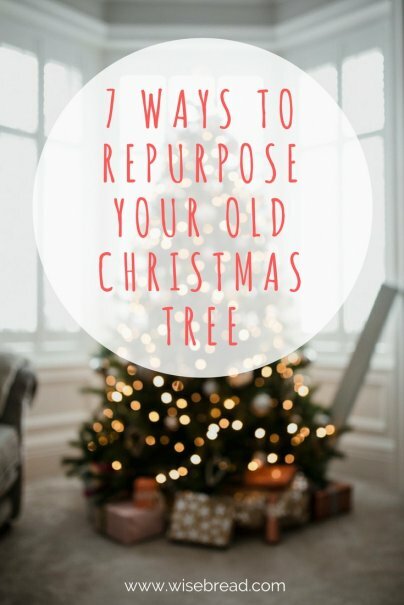 Taking a cue from this experience, here are seven other ways you can give new life to your old tree. If you have any animal sanctuaries near you, call and inquire about donating your discarded tree. I recently learned that a tiger rescue org in North Carolina repurposes trees as part of their enrichment program to make the tigers feel more at home surrounded by trees, and there's an elephant sanctuary in Tennessee that uses chemical-free trees as food for the animals who each eat up to 150 pounds of plant material per day. If you don't have an animal sanctuary nearby, you can provide for the animals in your own backyard by putting your old tree outside to create additional habitats for birds, squirrels, and other wildlife. Just toss it out there for them to climb and sit on or replant it so it stands up. You could even make a few pinecone bird feeders to hang from the branches to feed your feathered friends. It's a great way to bring beautiful winter birds like blue jays and cardinals to your yard. You also may be able to donate your tree to your Department of Natural Resources which may sink them in bodies of water for a fish habitat, like they've done at Lake Havasu with great success. If you live in a shore town, like I do, you recognize the importance of preserving the beaches and coastline, and one way conservationists do this is by building up the sand dunes using Christmas trees. The needled branches help catch sand from blowing winds, keeping more of it on the beach instead of blowing off it. Call your local authorities to see how you can participate in similar programs in your area. A friend of mine told me that in one area of the Jersey Shore, the dunes have become so big from the help of Christmas trees that there's a net gain of sand every year and the beach is becoming wider with each storm, instead of smaller. My garden will benefit greatly from all the needles that I'll spread in it, thanks to the abundance that I have from my defective fir. Pine needles are good as mulch because they decompose slowly to acidify the soil, which helps acid-loving plants like azaleas, hydrangeas, ferns, and dogwoods flourish. If you have a reciprocating saw or bandsaw in your garage, you can easily slice and dice the trunk into wooden rounds. These rounds make perfect canvasses for DIY craft projects, like rustic coasters. Morgan Statt, health and safety investigator at ConsumerSafety.org, recommends sealing the coaster wood before use to prevent any sap from leaking out. If you're not into crafting, you can still use those trunk discs. Edge your garden with them to create natural and really good-looking borders. You'll find lots of photos of how to pull this off (so easy!) on Pinterest. If you love the smell of pine in your home during the holidays, prolong the scent by upcycling your Christmas tree branches to make potpourri. This Christmas tree potpourri recipe uses two branches, essential oils, and cinnamon sticks.